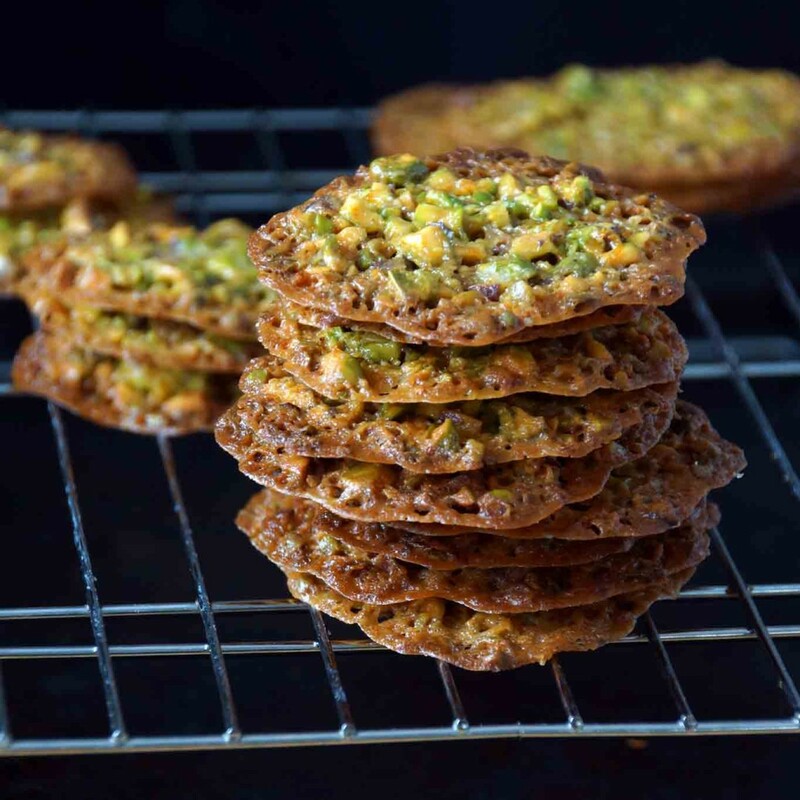 My pistachio florentines are the cookies you’ll probably pass over on your first go-around with the holiday cookie tray. They’re unassuming, thin and brown. No bells, sparkles, or whistles. You’ll skip right over them and make a grab for the little cutie with the sprinkles and frosting. At least, that’s what I’m hoping. I’m hoping you’ll look right past my irregularly shaped florentines so half of them come home with me. I love florentines and what they lack in “cute factor” they more than make up for in the flavor department. 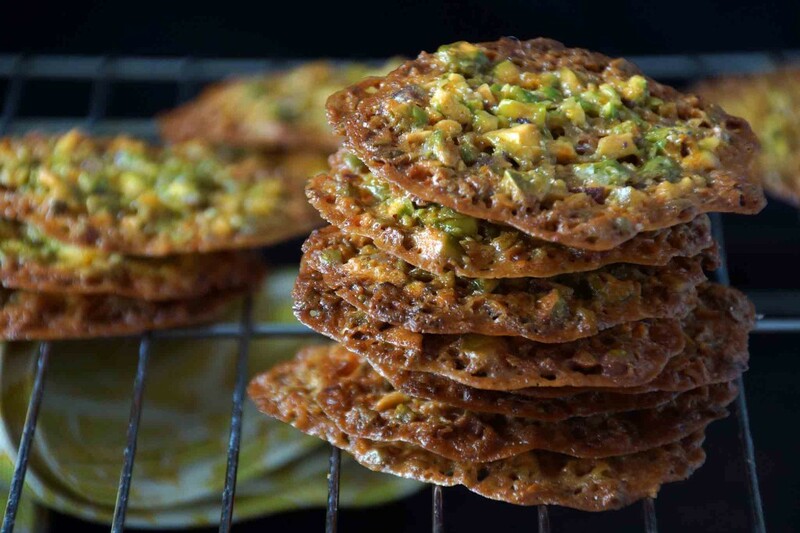 This rendition is especially good; the crisp, caramelly cookies are packed pistachios, with bursts of orange, hints of honey, and a dusting of flaky sea salt. They are sweet, salty, crispy, and perfectly addictive. Bonus: florentines are also impossibly easy to make. We don’t need to haul out the mixer or remember to get butter out to soften. 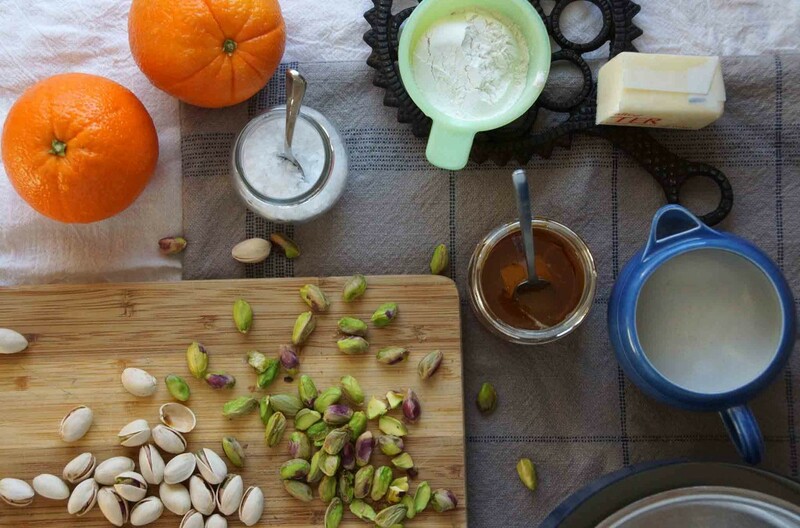 Just grab a bag of pistachios, a couple of oranges, honey, flour, butter, cream, sugar, and salt and you’re off and running. 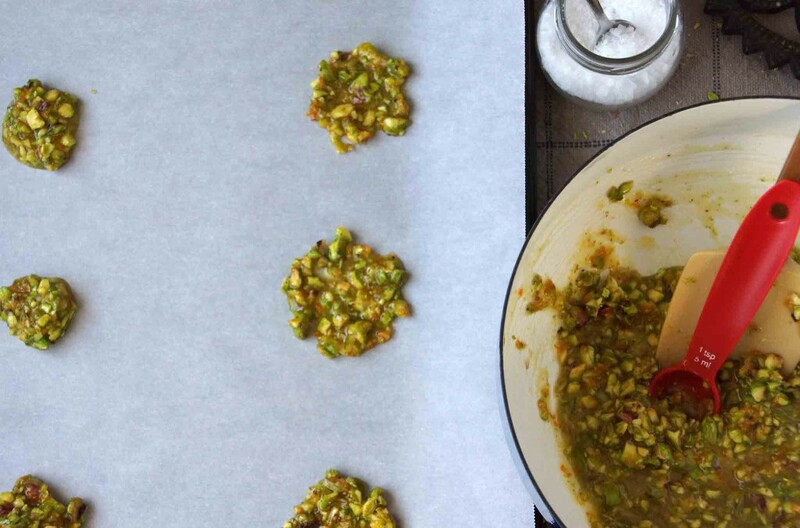 If you start with shelled pistachios, this is a very quick recipe. My grocery store was out (grr…) so I took the scenic route. 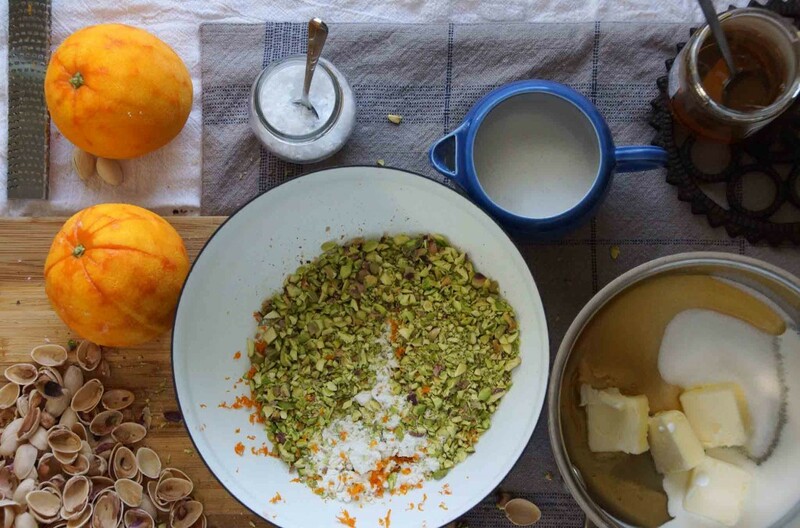 Shell and chop the pistachios and toss them in a bowl with a bit of flour and the zest of the oranges. Combine the butter, sugar, honey, and a splash of cream in a saucepan. 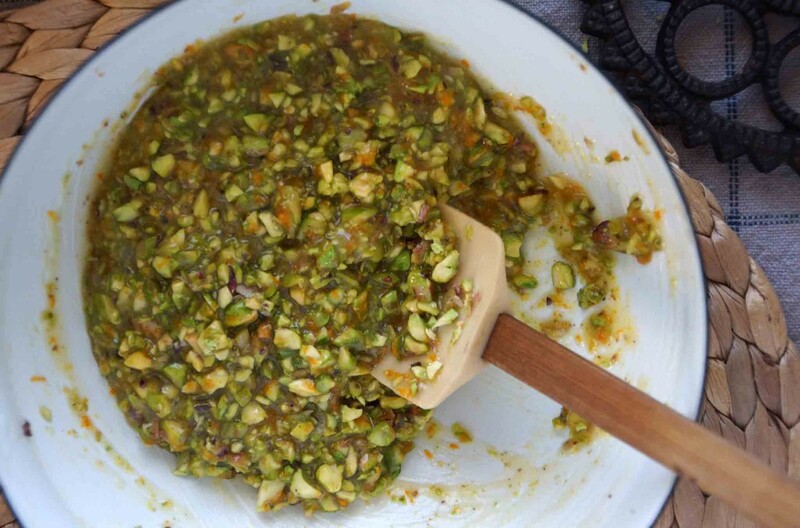 Bring the butter mixture to a boil, then pour it over the pistachios. Easy, peasy. Drop spoonfuls of the batter onto a cookie sheet. Flatten and sprinkle each cookie with a few flakes of sea salt. Bake, cool, and get ready to meet your new favorite cookie. These cookies are wonderful on their own or with a few roasted figs and zabaglione. If you brought a tray of cookies over to me these would be the first ones I grab. Never mind those silly ones with frosting…these are what I want!!! I make something similar in our Christmas cookie line up, but I would love to try this recipe. Honey and orange zest sound perfect. So I will have to share! I just made florentines for the very first time the other day (to be posted shortly)! They were very easy to make and absolutely delicious, but the recipe I found used pecans. I can’t wait to try these pistachio ones! Already bookmarked. 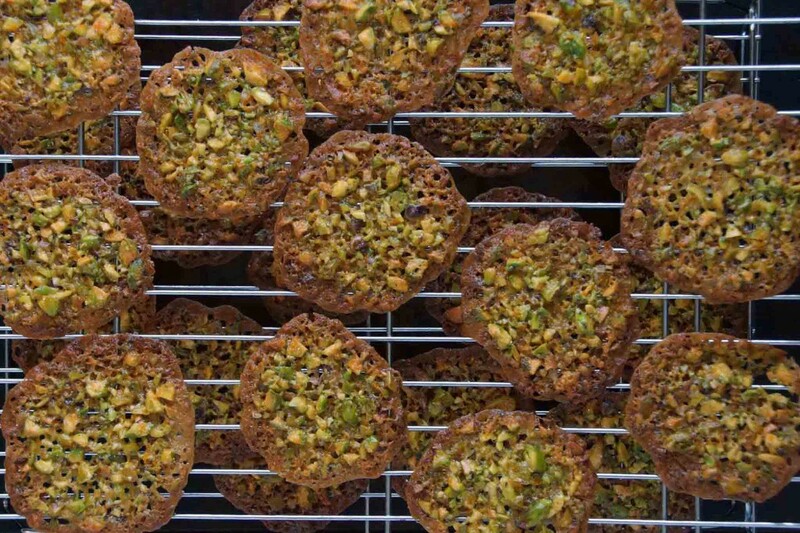 I would have never thought of making pecan florentines…I bet they would be delicious, like crispy little bites of pecan pie! These look delicious (and I don’t think they are lacking at all in the ‘looks’ department)!! 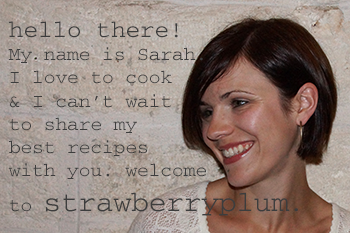 Thanks for sharing and congrats on the FPD feature! Thanks, Natalie! And they were delicious…seeing them on FPD today is just making me wish they weren’t so long gone.